The holiday season is upon us. As such, many of us are firing up the old fireplace for the first time since February. We all know that regular service and maintenance for our cars leads to increased longevity and safety for our vehicles. Fewer, but still some, know that a quality heating inspection is indispensable before firing up your furnace for the season. 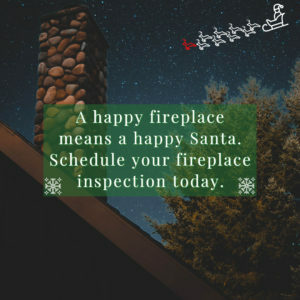 Few, except for the savviest, know that a quality fireplace inspection can keep your home safe and happy for Santa and the whole family. In this article we explain the different types of fireplaces, what parts of your fireplace require inspection, and the benefits of keeping your fireplace in tip-top shape. What Kinds of Fireplace Are There? Did You Know that Chimneys and Flues Also Come in Different Types? Masonry, either brick or stone, and with or without a tile-lined flue. Metal-lined flues with either double or triple-walled metal piping on the inside of a wood-framed or masonry chase. What Parts of Your Fireplace Require Inspection? Not every fireplace is built the same. Some have all the bells and whistles, while others remain basic. Your fireplace may include the following elements, and each of those elements can wear or require service or cleaning. Why Do I Need Fireplace Inspection? The primary reason you need a fireplace inspection is that objects and residue can become lodged in your flue or chimney. Ash, leaves, lint, dust and dirt can all accumulate in different elements of your fireplace over time. Why Does It Matter If Stuff Gets Stuck in My Fireplace? Objects caught in your fireplace may restrict airflow and gas. This restriction can cause the fire to escape the confines of your fireplace and move to other parts of your house. Are There Fireplace Inspectors Near Me? The home inspectors at Grush Inspections, LLC and the sub-contractors they hire have been inspecting fireplaces in the Reno and Sparks areas for years. Although a home inspection includes a general fireplace inspection, the professionals at Grush Inspections recommend getting your fireplace inspected by a fireplace specialist upon first purchasing a new home as well as when you haven’t used your fireplace in recent years. Not only will our inspectors confirm that your fireplace is safe, we will also inspect your fireplace for efficiency. An inefficient fireplace may as well be a hole in your wallet. Searching for a chimney inspection near me? Grush has you covered there, too. Contact us today, and we’ll make sure your fireplace is ready for Santa!